On page 52 of his book Debt Is Slavery, Michael Mihalik makes a point that has been running through my head for several days. Anyone can buy a $2,000 vintage Fender Stratocaster guitar, but can they play it? Which is better, owning the most expensive tennis racket money can buy or winning the local tournament? Instead of buying a $200 pair of basketball shoes, why not dedicated another 30 minutes a day to practicing ball-handling? I am not saying that everyone should stop buying stuff. There’s nothing wrong with owning a $2,000 electric guitar. And not everybody will win the local tennis tournament. But it’s much more satisfying to be a creator than a consumer. We should focus on improving our skills and abilities, not increasing our stack of possessions. A quick look at one piece of my own life bears this out. I like pocket notebooks. During my years as a young professional who still harbored some little sliver of a dream of someday becoming a writer, I would often pick up a wonderful, shiny, expensive new Moleskine pocket notebook. I’d keep it with me for a while, sitting down at coffee shop tables and opening it up before me, dreaming little dreams of being a great writer. On occasion, I might even write something down in that notebook. But, after a while, I’d put it aside somewhere – in a dresser drawer or somewhere else – and then a few months later, the bug would strike me again. So I’d buy another nice, shiny, new notebook and fill up a few pages with jottings, only to eventually add it to my ever-growing pile of journals and pads here and there around the house. Skip forward to today. 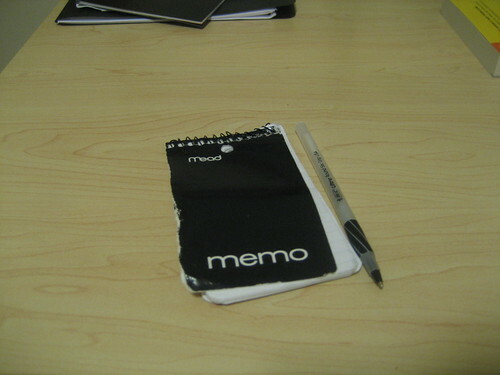 Today, I keep a tiny, dirt-cheap Mead memo notebook in my pocket at all times. And I use it and abuse it. I fill that thing from top to bottom with notes, and it’s often a race with time as to whether I beat the notebook to death before I fill it with my notes. Here’s a picture of a recent one that’s actually in fairly good shape compared to how bad it gets. Similar to this is an epiphany I had just a month ago. I spend a lot of my time reading books and magazines, but, sadly, I was spending even more time accumulating books to read. It reached the point where my actual collection of books that I wish to re-read again and share with my children was much smaller than my “to be read” stack. So I took a stand and declared a moratorium on more books. What good is a book if it’s not being read? What good is a notebook if it’s not collecting your thoughts? What good is a pair of running shoes if you’re not out running? What good is a keyboard if you’re not practicing your music? A lot of us want to accomplish something great. We want to read the great works of Western literature. We want to train for and run in a 5K. We want to write the “Great American Novel.” We want to have the perfect home for our family. The truth is that no product on earth will ever make these things happen. You can get the great books of Western literature for free from the library, but you can’t buy the time and patience and concentration to read them. You can have the best running shoes on Earth, but if you’re not out there jogging thirty minutes every day, they’re useless – the barefooted fellow will do substantially better. You can have all the slick notebooks in the world, but if they’re just filled with empty pages, they’re useless. Over at Get Rich Slowly, J.D. is going through a similar epiphany about his comic book collection. He looks upon his shelves of comics and asks himself the tough question: Will I ever read these? The real question is do those comics add genuine value to his life? That’s a question he has to answer for himself. If they do, then there’s no better time than now to pop open Crisis on Infinite Earths. If they don’t, then he might as well start packing them up and selling them on eBay, because they’re just empty clutter without the creative and intellectual spark. If you harbor great ambitions and personal goals and find yourself buying what you need to start, but never achieving liftoff, consider a different approach. If you want to try something new, find ways to get involved with it for free before accumulating stuff and wasting money. Start with a cheap pocket notebook instead of an expensive one for your writing ambitions. Check out books from the library to fuel your reading. Start jogging with the shoes you already have. If you find after a period that the spark is really with you, then jump on board, but focus on only the items you need and have a distinct purpose for that you can’t get elsewhere. Otherwise, you’re just accumulating and spending for the sake of accumulating and spending – and that’s a mistake.